Workato is a cloud-based solution created to help businesses link their web applications without any hiccups or hitches. Using a very simple and straightforward interface with drag and drop functionality, users can connect web applications easily. On top of that, Workato also offers capabilities and features that allow users to create multi-step integrations with multiple apps, resulting in smooth and seamless data flow across your favorite applications. On the Workato platform, people can collaborate and discuss with other Workato users via the open community. 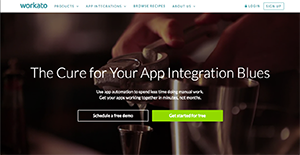 Looking to create integrations? You can look for people with the same integration needs and share ideas, brainstorm, and improve upon each others’ integration flows. Workato offers thousands of pre-built integration flows between 75 most popular apps and you can simply own those integrations. That or you can create your own integration flows quickly and easily and tailor them according to your needs. Developers of Workato understand how complicated and demanding the requirements for integrating data, workflows, handling exceptions, app customizations, and data security can be. Thus, the Workato system is developed to ensure that people have a platform where they can create and deliver their own powerful integrations that suit their skill levels, business requirements, expectations, and economics. At Workato, people get an application integration system that lets them build integrations from the ground up, resulting in a friendly, more tailored easy-to-use application integration service that is enterprise grade, powerful, and secure. As Workato has addressed challenges of integrations, people now can create powerful application integrations with cost-effective approach. Workato costs at least ten times less compared to other full-featured integration services. This also means integrations with Workato are at least ten times faster, making them accessible to all. Workato is compatible with applications’ native data models and grants users robust capabilities to iterate through these data structures. The system also supports even the most complicated data structures and provides powerful yet easy mapping. When building integrations, users are guided through every step and process, ensuring that your integration is free from error. Workato’s intuitive, error logs document steps in your recipe and notify you about data errors. This allows you to see what is causing your integration issues and immediately fix offending data and run it through again, or delete it and continue. You address bad data at their source, instead of issues affecting your other apps and compounding the problem. It's essential to note that almost no app in the IT Management Software category will be a perfect solution that can meet all the needs of various company types, sizes and industries. It may be a good idea to read a few Workato reviews first as specific solutions might excel exclusively in a very narrow set of applications or be created with a really specific type of industry in mind. Others may work with an idea of being simple and intuitive and as a result lack complicated functions needed by more experienced users. You can also find software that support a wide group of users and provide a rich feature toolbox, but that usually comes at a more expensive price of such a software. Ensure you're aware of your requirements so that you select a software that provides all the elements you search for. How Much Does Workato Cost? We realize that when you make a decision to buy IT Management Software it’s important not only to see how experts evaluate it in their reviews, but also to find out if the real people and companies that buy it are actually satisfied with the product. That’s why we’ve created our behavior-based Customer Satisfaction Algorithm™ that gathers customer reviews, comments and Workato reviews across a wide range of social media sites. The data is then presented in an easy to digest form showing how many people had positive and negative experience with Workato. With that information at hand you should be equipped to make an informed buying decision that you won’t regret. What are Workato pricing details? What integrations are available for Workato?